Scientists are facing a number of barriers as they try to develop circuits that are microscopic in size, including how to reliably control the current that flows through a circuit that is the width of a single molecule. Alexander Shestopalov, an assistant professor of chemical engineering at the University of Rochester, has done just that, thereby taking us one step closer to nanoscale circuitry. "Until now, scientists have been unable to reliably direct a charge from one molecule to another," said Shestopalov. "But that's exactly what we need to do when working with electronic circuits that are one or two molecules thin." 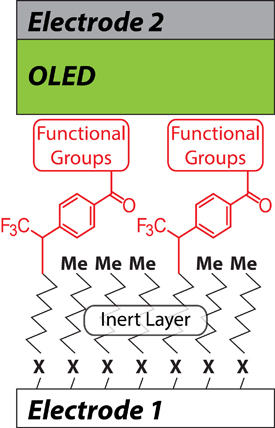 Shestopalov worked with an OLED (organic light-emitting diode) powered by a microscopically small, simple circuit in which he connected a one-molecule thin sheet of organic material between positive and negative electrodes. Recent research publications have shown that it is difficult to control the current traveling through the circuit from one electrode to the other in such a thin circuit. As Shestopalov explains in a paper published in the journal Advanced Material Interfaces, the key was adding a second, inert layer of molecules. The inert—or non-reactive—layer is made of a straight chain of organic molecules. On top a layer of aromatic—or ring-shaped—molecules acts like a wire conducting the electronic charge. The inert layer, in effect, acts like the plastic casing on electric wires by insulating and separating the live wires from the surrounding environment. Since the bottom layer is not capable of reacting with the overlapping layer, the electronic properties of the component are determined solely within the top layer.